Each day in our nation, there are an average of over 3,470 attempts by young people grades 9-12. If these percentages are additionally applied to grades 7 & 8, the numbers would be higher. If you think about life, in general, you may find all kinds of reasons to end your life early! However, there are reasons to NOT commit suicide! Basically, Jezebel is telling Elijah she is going to kill him, or she’ll die! Dear reader, please consider how that great faith, great prayer, and a great worker of God can become disturbed and disillusioned in their mind. Notice how he began to think in himself, 1 Kings 19:3,4, “And when he saw that, he arose, and went for his life, and came to Beersheba, which belongeth to Judah, and left his servant there. The despondence began when he saw what Jezebel said. He handled it by running away. He ran away from everyone, including his servant. When depression sets in, a person wants to seclude themselves. Not want to be around anyone. This only makes things worse, leading to suicide ideation. Don’t ever think that you are immune to thoughts, desire and even completion of suicide. There is a spiritual battle that is ever before us. We live in constant conflict with the powers of darkness. The eternal Kingdom of Darkness versus the eternal Kingdom of Light. This is why we need to don the whole armour of God (Ephesians 6:11) One piece of this armour is the helmet of salvation. This helmet is to protect the mind. Suicide ideation begins in the mind. Thoughts that are accusing, alarming, and aching. In our scripture example of Elijah, he had thoughts of low self-worth, coupled with feeling overwhelmed. A great victory wrought through him, yet now feeling like the victim at the words of a wicked woman. Please consider what suicide is not. 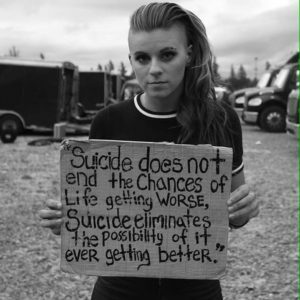 Suicide is not a noble act of valor. In the completion of suicide, the person’s survivors do not rally and exalt this act as some kind of nobility. Quite the contrary, it leaves a feeling of numbness, and shame, and sorrow. Suicide is not an act of courage. Family and friends who are left in the bitter aftermath of completed suicide are never encouraged that their father, or mother, sibling or friend was acting in a courageous manner. The emotional feelings are surmounted with much confusion and conflict in their own minds. Thoughts they will have of “how could I have stopped this?” and “what could I have done different to help?” The survivors will be discouraged within their own selves, not looking at the deceased as a Hero. Suicide can be looked at as an act of disbelief. Not believing that God is all wise, all powerful, and all caring. This is not an insult, or degradation, for as we have studied in the life of Elijah, a man who has the Lord’s touch, power, and unction, is susceptible to thoughts of suicide. I know personally people who have completed suicide. One in particular did so when he was about 21 years of age. He had gotten involved with a female at work to some extent, and could not overcome feelings of degradation. He had been a preacher who preached with power and unction. He had been a faithful son to his parents, as well as his church. He was always active in the community with witnessing and soul winning. Whatever degree his communication and relationship with this female achieved, he knew it was sinful and wrong, but could not ever believe that God would forgive him and use him in the ministry again. His thoughts of suicide did not stop at just thoughts. His friend found him after finding the note he left behind. But, dear reader, he left much more behind. He left a broken hearted family behind. To the date of the writing of this Thesis, when I have preached in churches where his Mother and Father were in the congregation, I witness their tears and sorrowful faces. In my spirit, I weep with them, for I share their painful memories of how their son used to preach with such compassion and power. Suicide does not believe that God cares. Suicide does not believe that God is able to forgive. Suicide does not believe that others care or will forgive, or even forgiving self. 1 Peter 5:7 “Casting all your care upon him; for he careth for you.” Know, dear reader, that God does care. Not only can He do something about your needs or problems, He cares. Knowing that someone cares for you goes a long way. By faith, we trust Christ Jesus as our personal Saviour. By faith, we trust God to care and forgive us. If you have never trusted Christ as your personal Saviour, my plea is that you will believe on His death, burial and resurrection. If you were the only person on Earth, He would have went through the cruel scourging, mockings, and crucifixion for you.